The entrance to the space is at either side of the back wall meaning it’s clear how long the container is before you get inside it which means it’s immediately apparent that the cinema screen is at the half way point (or thereabouts). The image on screen is of the sea. The very same sea that’s just outside except something is subtly different – your mileage, or more accurately, your weather may vary; the difference could be quite pronounced – the light isn’t quite the same somehow. In a way the image on a screen half way back in the box suggests a camera obscure. Certainly the image is back projected and clearly depicts the view from the front of the box. But unlike a camera obscure projection this one is the right way up and the image is clearly a video projection. While a camera obscura is always an incredibly fascinating way to see the world, in a way this lacks drama. In part that’s down to the view. A right way up view of the sea isn’t inherently that interesting when the actual sea is just outside. And yet the work does hold my attention. One of the things that interests me most is the aspect ratio of the image. 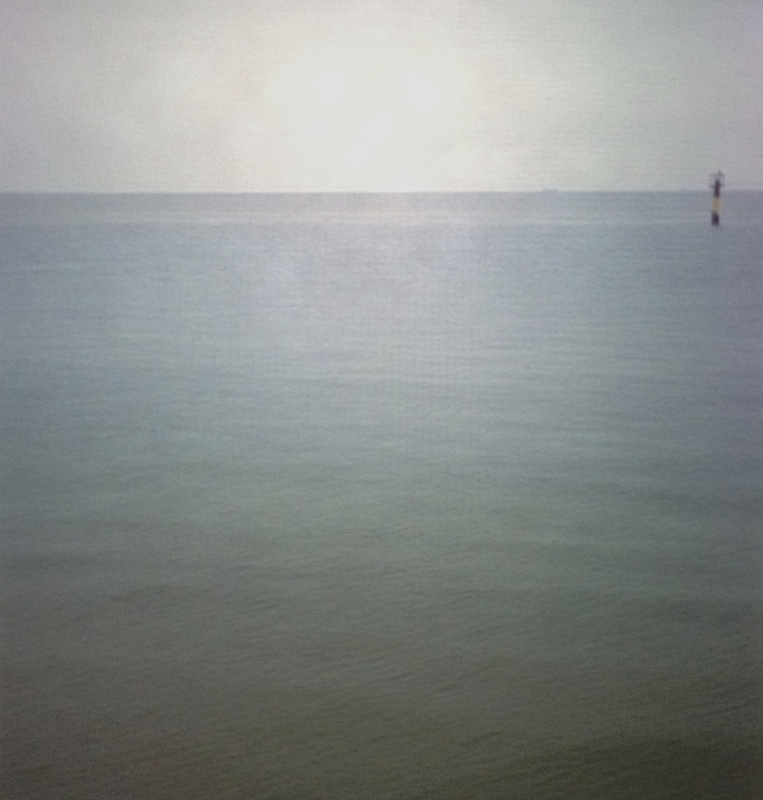 The scene is a landscape but the image is fractionally on the portrait side of a square, perhaps making this a portrait of the sea. Or even, given that it’s almost a square, should it be seen as an abstract? Given the lack of activity outside, the image is actually fairly abstract. 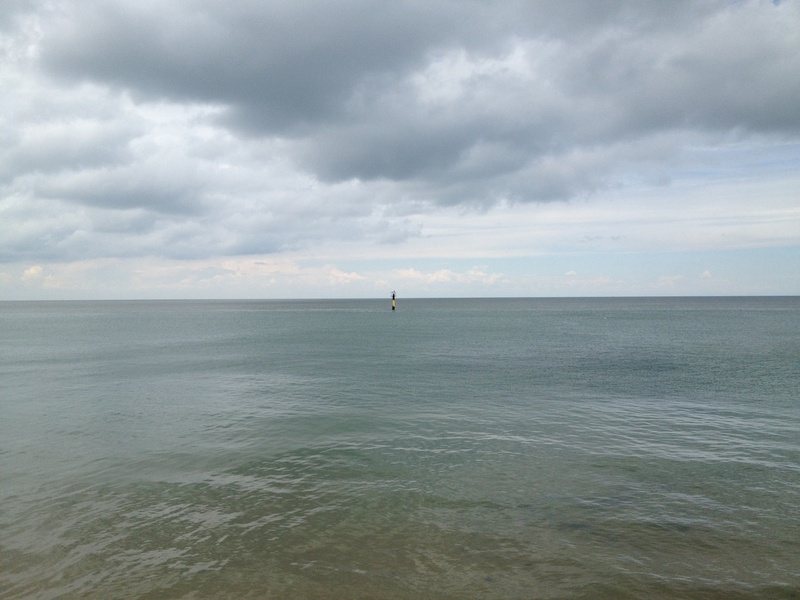 But a greater fascination comes from understanding the nature of the the piece and that brings me back to that subtle difference between the sea I’ve just been looking at, unmediated, outside and the projected sea on the cinema screen in front of me. 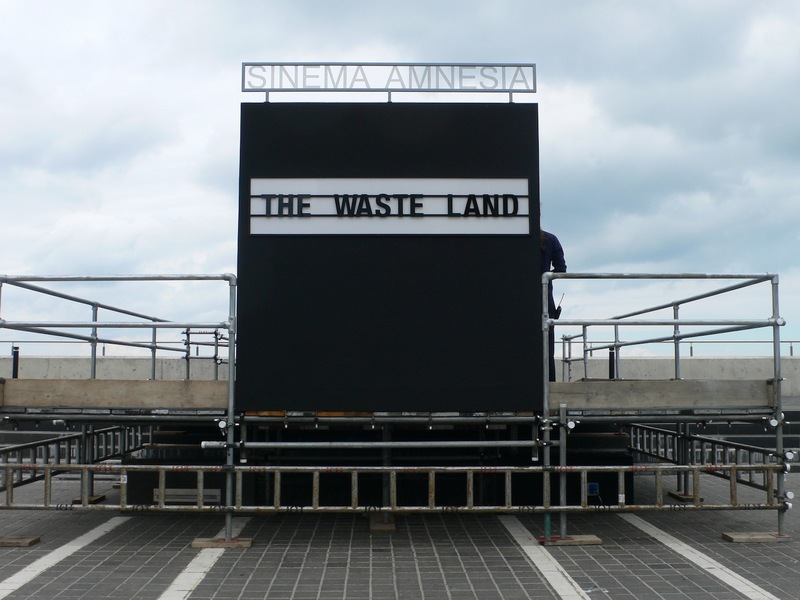 The Waste Land is showing the sea outside Sinema Amnesia, but yesterday’s rather than today’s view. The seascape I’m watching is exactly 24 hours old. And what of the title? Is Margate the waste land? Well, in a sense it is but indirectly. T S Eliot’s poem The Waste Land (which also gives form to Paul Noble’s Nobson Central drawings) was in part written on Margate beach. This is the second outing for Sinema Amnesia though. In 2010, the work was installed beside the Dardanelles in Turkey where the film was called Ulysses. Wherever Sinema Amnesia is, it offers a distinct and considered view of the world outside in the simplest possible way. This is the world in real time. But the world of yesterday. And as we watch yesterday played out on the screen the images of today are being stored up for tomorrow, replacing what we’ve just seen. This is a work that leaves no trace. Sinema Amnesia has a short term memory, but anything that happened more than a day ago is gone. Visiting on a somewhat gloomy day – and let’s face it, those are what this summer’s been best at – I could almost feel the image fading from memory before me. 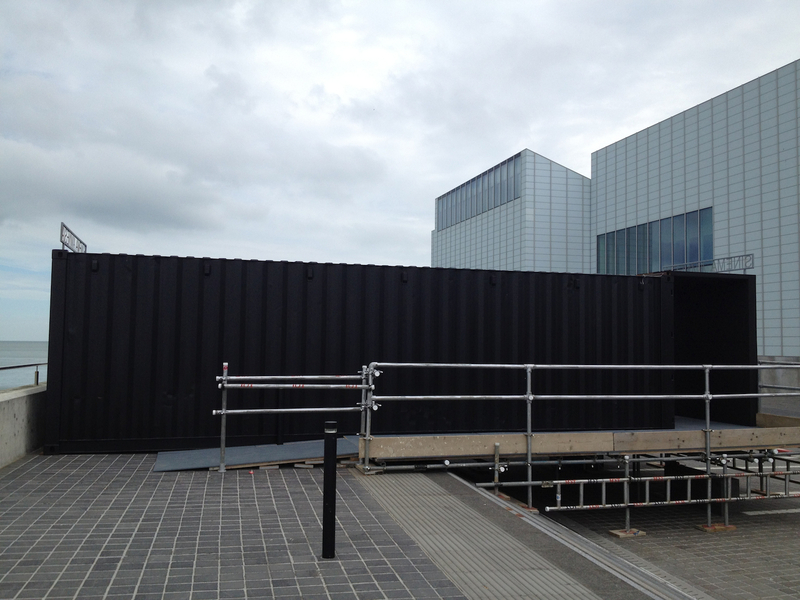 Mark Wallinger: Sinema Amnesia is oustide Turner Contemporary in Margate until 27 August; open during gallery hours. 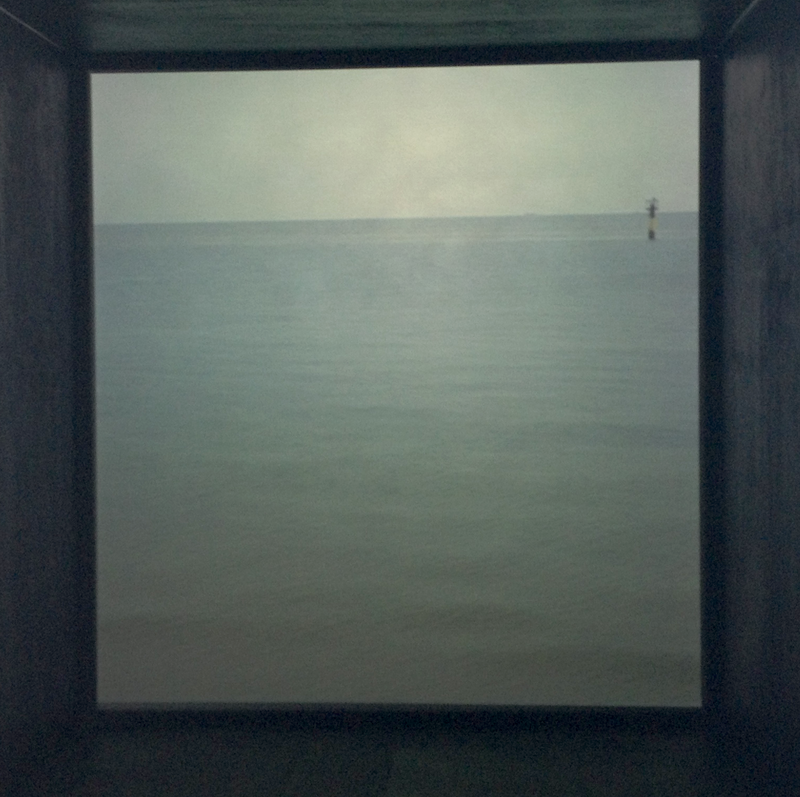 This entry was posted in Film/Video, Installation and tagged architecture, art, camera obscura, cinema, installation, landscape, Margate, Mark Wallinger, sea, seascape, sinema, Sinema Amnesia, The Waste Land, video by Ann Jones. Bookmark the permalink. THE WASTE LAND is such a compelling excellent documentary. Love the minimal feel of this! They really are! I’ve seen them used before as exhibition spaces and/or parts of installations. There have been shipping container studios in London for quite a long time and now there are shipping container shops too. I suspect cold in winter. But then that’s kind of the law with studios. A quick google suggests they look pretty swanky now: http://www.containercity.com/container-city-one.html – the first container studios there were opened in the late 1990s and were a bit less slick as far as I recall. Those are very swank indeed. I was imagining them without windows. That makes a huge difference.